This photograph shows an exterior view of the S. H. Snyder Pharmacy in Neodesha, Kansas. 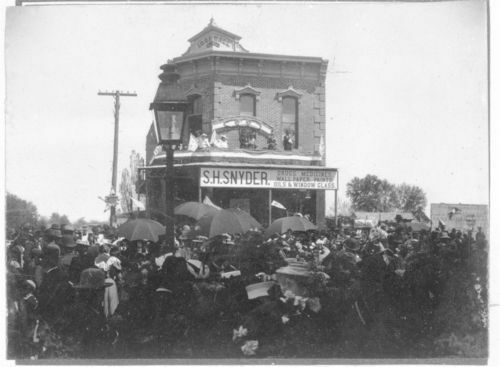 The store's sign below the balcony reads, "S. H. Snyder. Drugs, medicines, wall paper, paints, oils, and window glass." The sign at the top of the building's façade reads, "I. O. O. F. Hall." A crowd of people is visible standing outside the building, with several people holding umbrellas. There are several women visible on the balcony of the building, and the railing of the balcony is decorated with bunting and several unidentified flags. Holding Institution: Mrs. Ray Garrett, 1965.